The moos of the horses from the stable and loud trumpets of the war elephants in the royal pilkhana (a shed where war elephants stayed) announced the beginning of another day in the wee hours at the Royal Fort Complex at Fatehpur Sikri. They were about to move out to the adjoining field near the lake side for war practices. The Mughal General Man Singh was on his toes making his last minute checks. Though no war was nearby but to sustain the Mughal Shahi the emperor believed in the principle of motivating his royal army with simulated war situations which was infact very effective for subduing local rebellions and intolerable enemies at the borders of the empire. Akbar already had a handful of enemies from his ancestral land in the West as well as from the Hindustan. South India was not fully under the emperor’s control though his kingdom had been spread upto the banks of Godavari. Even many Rajput nobles and kings were on their toes including the great Maharana Pratap Singh of Mewar…..Man Singh looked a little tensed today, as he knew that the Shahenshah would be soon joining him with the mock drill…He looked back only to find the emperor approaching towards the Royal Stable……. 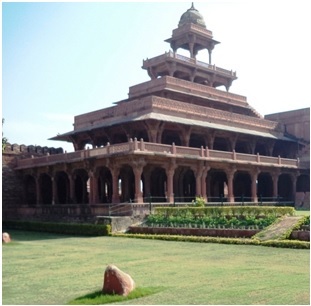 The royal stable is located to the western wing of the Fatehpur Sikri fort complex. 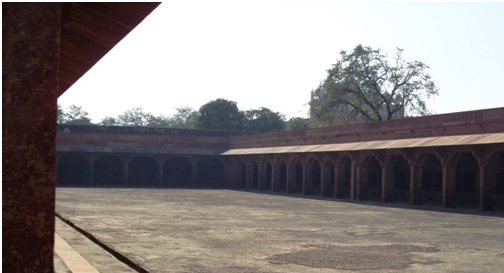 The entire area consists of a huge rectangular paved courtyard surrounded by a pillared hallway made by red sandstone. The long hallway of the royal stable contains several stone hooks located at regular intervals which were probably used for harnessing the royal horses. The walls in the stable hallway contained cubicles providing space for giving water and fodder for the horses. The roof of the hallway is unique from the architectural point of view being supported by horizontal slabs supporting the monumental rectangular roof. Experts and archaeologists are of the opinion that part of this stable was exclusively reserved for the royal women whereas the rest was used by the emperor, senior ministers and the army. It is believed by many scholars that the royal stable might once had served as a part of the Harem principally meant for the quarters and living rooms of the women not belonging to the royal family. Later on when such quarters were merged with the royal harem complex the entire mansion was used as a stable. 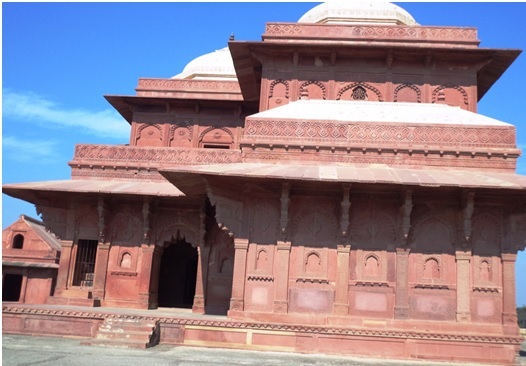 The large cubical red sandstone palace located to the north of the royal stable is commonly known as the Birbal Palace. There are controversies whether this majestic mansion belonged to the royal advisor and ‘Navaratna’ member (Nine Gems at Akbar’s court) Birbal or to Akbar’s queens Ruqaiyya begum and Salima Sultana. This is because, how the residence of the prime minister of the Mughal court was allotted so near to the royal harem complex? Yet if examined closely, there are many architechtural evidences of a hindu mansion which could also mean it might had been used by Birbal. According to historians, this beautiful, two storeyed red sandstone mansion (known as the Birbal Palace) was built in the year 1571. It is said that Birbal (1528–1586), originally known as Mahesh Das, was an eminent Brahmin scholar, poet, singer and a very intelligent personality. Folklores have described Birbal as a royal “Bidushak” or buffoon who used to enchant the emperor by his acts of wisdom. The emperor used to consult Birbal before taking many important political and administrative decisions in his court. Due to this close association with the emperor, he became an important member of the royal court (1556-1562) and was even honoured as a member of the ‘Navaratna’ (Nine Gems). 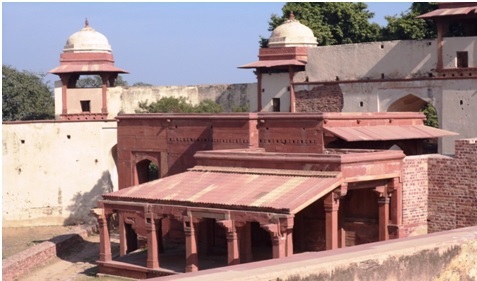 The Birbal mansion is cubical in shape consisting of four equi-dimensional rooms which are connected with one another by opened doorways. The top of the mansion consists of triangular chhappar ceiling with pyramidal roof-tops. The two porches serve as gateways for entering interconnected with the help of open doorways and two porches that serve as entrances in the northwest and southeast sides of the mansion. While entering the mansion through any one of the porches, we found that the rooms located inside were square in shape with flat celings. We were amazed to see the beautiful carved pilasters inside the rooms dividing the interior of the mansion into three compartments. 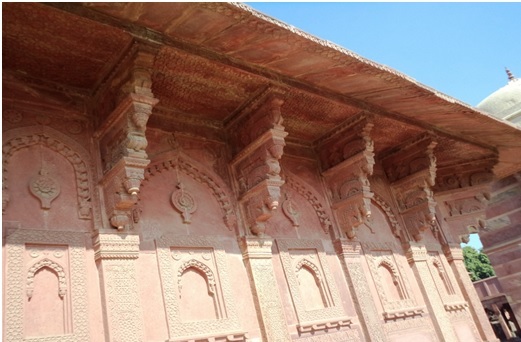 The walls exhibited exquisite carvings and sculptures made over red sandstone base. 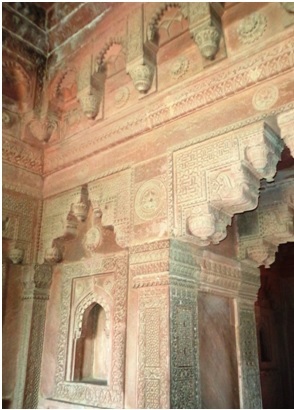 On close examination, the walls and the interior layout of the carvings at the Birbal Palace have marked resemblance with those seen at the Jodha Bai Palace. Presence of hindu motifs in the form of conch, lotus etc and decorated racks probably indicate that they were either used for housing small Hindu deities for worship or ‘diyas’ for worhsip. 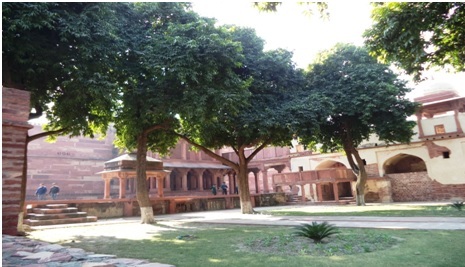 The north-west corner of the Fatehpur Sikri fort houses an important entrance to the fort complex. It is known as the Elephant Gate or Hathiya Pol. It is said that emperor Akbar used to enter the Fatehpur Sikri fort riding his childhood elephant “Gajamukta” through this grand gate. The entrance of the gate once contained two beautiful stone elephants (which is in ruins today) located on its either sides. The elephant gate is made up of rubble, red sandstone and marble. It is fortified by the large walls containing battlements. The entrance arch contains a 3m wide gallery with narrow staircases leading to the top of the fortification walls and battlements. 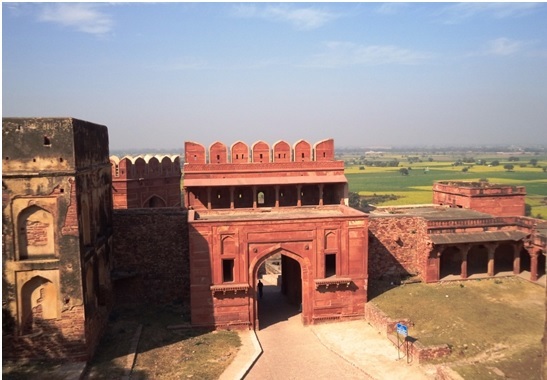 The gate complex consists of naqqar khanas which harboured rooms for the bands and drummers who played during the entry or exit of the royal procession from the fort. One can also find several ruined quarters in and around the gate which served as caravanserais for the visitors and traders. You can imagine the pomp and grandeur of the royal procession when the emperor used to ride in and out sitting on the back of Gajamukta through the famous elephant gate with his troops. The inside of the elephant gate harbours a large courtyard flanked by small rooms which formed the ‘Royal Elephant Shed’. This might had been also the shed for the emperor’s most favourite elephant Gajamukta. Hiran Minar is an unique 21.34m tall minaret located outside the elephant gate. The minar probably got its name because prince Salim (Jahangir) used the vicinity of the minar as a sanctuary of deers. The minar follows typical Iranian architectural designs and features. The tower is located over an octagonal plinth which again stands on a square shaped platform. The octagonal minaret is about 3.91m high. Its middle portion contains spiked stone projections resembling elephant tusks or arrow ends stuck on a body. The apex of the tower consists of a terraced roof harbouring a chhatri. Akbar was an ardent animal lover since his very childhood. 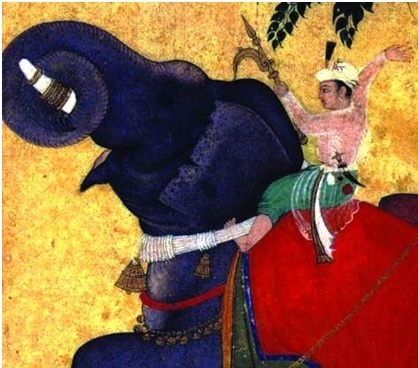 The legendary elephant Gajamukta was Akbar’s most beloved pet. The bond in between the little master and young Gajamukta was so remarkable that both of them seemed to be inseparable. Like Rana Pratap’s horse Chetak, Akbar’s Gajamukta served his master till its last breadth. The battle of Haldighat (1576) and its consequences are known to many of us. But how many of us are aware of the story of Gajamukta? It is said that Gajamukta fought in the battlefield like a brave and faithful soldier. The legendary Rajput king Rana Pratap was riding his favourite horse Chetak and Akbar’s general Mansingh was on Gajamukta. The Mughals attacked Chetak to corner Rana Pratap. In reply the Rajputs also targeted Gajamukta. The Rajput archers rained volleys of arrows toward the Mughal general Mansingh and Gajamukta. Inspite of being fatally injured Gajamukta fought the battle with arrows protruding from all over her body. It is said that she took her last breath in the lap of her master Akbar after the end of the battle. 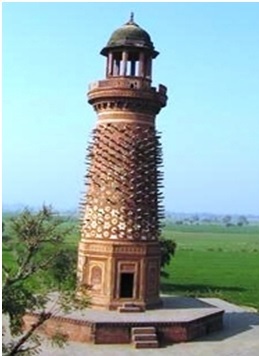 While looking at the architectural design of the Hiran Minar, a question may arise why would Akbar build a tower with such a strange appearance? Was this tower a memorial to his homage to his favourite Gajamukta? Was this the tomb and final resting place of Gajamukta? But what actually lies in the pages of the history, we never know. Yet the legend of Gajamukta and the story of the bond with her master would never ever fade from our memory. 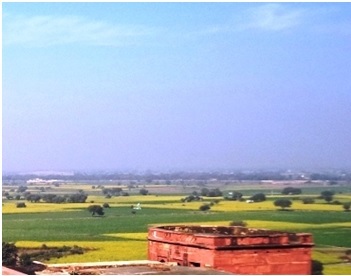 The lush green agricultural land seen from the elephant gate of Fatehpur Sikri fort was once a natural lake which served as the principal water source for the city of Fatehpur Sikri. But due to the severe draught and famine in the year 1585, this lake got dried up and this probably led the emperor to abandon Fatehpur Sikri. Nagina Masjid is a small mosque located adjacent to the northern side of the Royal harem. It was probably meant to enable the royal ladies offer prayers. The mosque is simple in design. It contains three bays divided by simple pillars supporting the pointed arches above. The mosque has a paved courtyard. The royal ladies ’garden and the royal hammam are located near to the mosque. The royal hammam is located adjacent to the royal ladies’ garden. It is a squarish paved pool, covered by a stoned roof with small stairs leading into the pool. As the hammam is located very near to the royal harem, it can be said that it was probably meant exclusively for the royal ladies and the emperor. It could be possible that the sides of the hammam, which are opened nowadays, were covered by curtains or purdahs for enabling the pool to serve as the hammam for the royal ladies. Sunehra Makan or the ‘Golden House’ was built for Hamida Banu Begum (also known as Maryam Makani), mother of emperor Akbar. The palace is also known as ‘Maryam’s Palace’ (house of the woman equal in rank to ‘Mary’ or the Mother). It is said that the palace got its name due to the rich golden color it once used to show during the rule of Akbar. Although located a little away from the royal harem complex, the grandeur and glamour of this mansion spoke high of the authority and power enjoyed by Hamida Banu Begum among the leading ladies in the Mughal family. It is said that Gulbadan Begum, sister of the second Mughal emperor Humayun and the aunt of Akbar used to accompany Hamida Banu Begum. She was one of the best scholars and a master chronicler of her time. Her literary works in the form of ‘Humayun Nama’ or the biography of emperor Humayun (father of Akbar) had made her immortal in the pages of history. It was a thrilling to feel that a personality of her caliber had spend timeless moments studying and giving shape to her famous literary work in this famous monument. 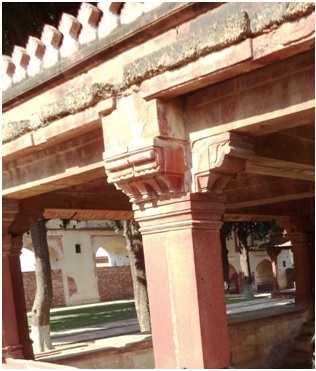 The Sunehra Makan is situated on a small platform or plinth with stairs leading to the entrance of the palace from all the four sides. The palace consists of four rooms inside, a central hall with verandahs or porticos, and three small rooms two in the south and the other in the north. 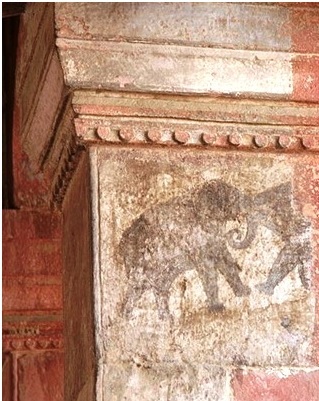 The mansion contains the fading remains of beautiful murals depicting scenes of wars, tournaments and elephant fights that were common forms of sports and entertainment during the Mughal rule. Each room in the Sunehra Makan was once exquisitely painted which has now faded away through the course of time. Some parts of the ceiling and walls still bear wonderful colourations depicting the past glory of the mansion. Surprisingly inspite of being a non-Hindu queen Hamida Banu’s palace was decorated by sculptures of rows of elephants, swans, and bears as well Hindu motifs inside the relief works present on the wall brackets seen in the northern facade of the mansion. It is said that Hamida Banu had whole heartedly participated in various Hindu festivals and religious activities performed by queen Jodha. 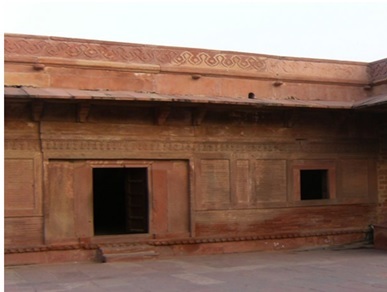 Jodha Bai’s kitchen is a simple one storey red sandstone mansion situated to the left of the Sunehra Makan. While entering this mansion, we observed that the walls once decorated by finely carved designs had faded and worn out by black smoke created from fire. 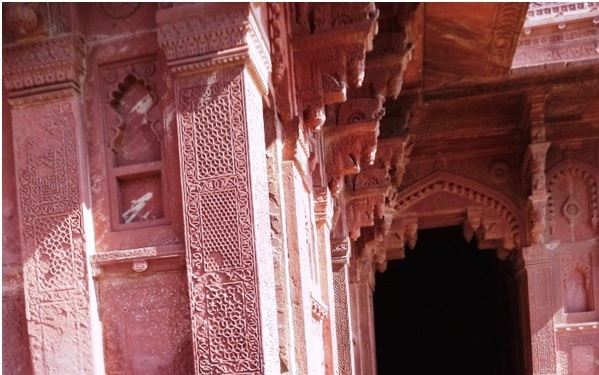 As compared to the interior, the outside walls exhibit more elaborate carved designs on the red sandstone walls. Such works are more prominent in the form of a pelmet or valance. It said that Akbar was very fond of the culinary skills of his Khaas Begum Jodha Bai. Her traditional Indian cuisine was liked so much by Akbar that the queen used to personally involve herself for preparing the emperor’s favourite dishes. Perhaps this could have been another aspect which flamed the intense romance between queen Jodha & Akbar, which was hardly revealed ever in the pages of history. 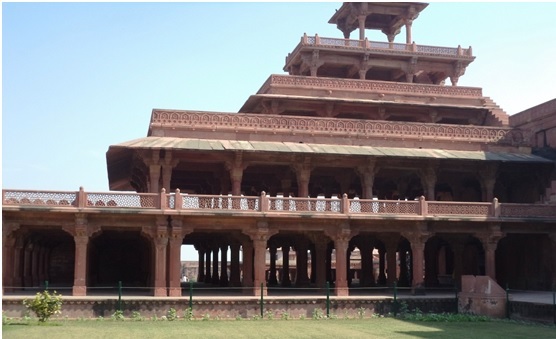 The Panch Mahal is a remarkable five storey mansion made of exquisite pillars and jaalikas. The mansion has got the name “Hawa Mahal” or the palace of winds for its unique architectural structure (Badgir or wind trapper) through which it could cool off hot summers by trapping flowing breezes in its extensive pillared hallways. This pleasure mansion was one of the most desired hangouts for the royal ladies and the emperor particularly during the summer months. Probably the Panch Mahal was used for hosting musical concerts, dances and other entertainment programs. Careful observation of the structure of this pyramidal mansion shows that the building is entirely made of pillars and four principal storeys of decreasing size. The top storey is housed by a chhatri. It is peculiar to note that these four storeys are arranged symmetrically over the multi-pillared ground floor, which contains 84 exquisitely sculptured red sandstone pillars. The first storey consists of 56 pillars, the second 20, the third 12. These uniquely arranged pillars on various floors give the entire mansion a typical pyramid like structure. 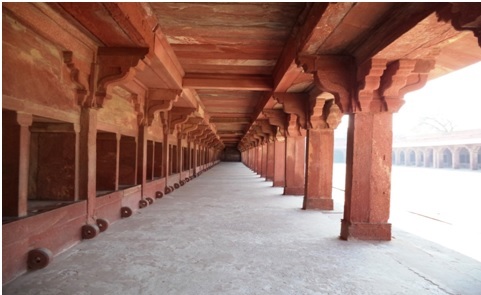 It is said that previously these pillars were joined at the exterior by fine jaali screens which acted as veils for the royal women to enjoy a warm evening at Fatehpur Sikri. Each storey of the Panch Mahal is connected with the other by a staircase lying at the rear side of the mansion, which is generally not seen from the front. 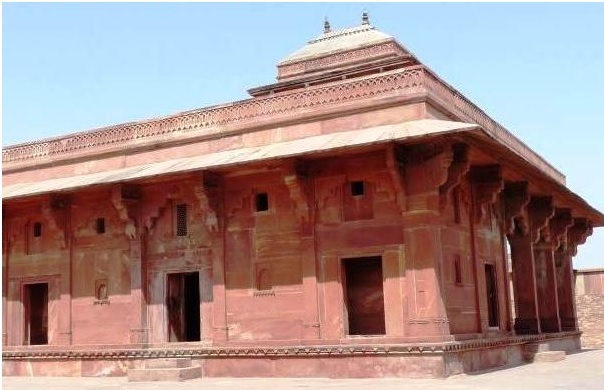 The top floors of the Panch Mahal provide a panoramic view of the beautiful Anup Talab, and almost the entire Fatehpur Sikri city complex as well as the adjoining villages in the plains lying way below the fortified city. The Panch Mahal used to have an exquisite garden and lawn in its northern side which is still well maintained by the Archaeological Survey of India.